The ministry of health has introduced user fees for most of the services in government hospitals. Only emergency services, under five services and treatment of very old people will be free, in some cases. 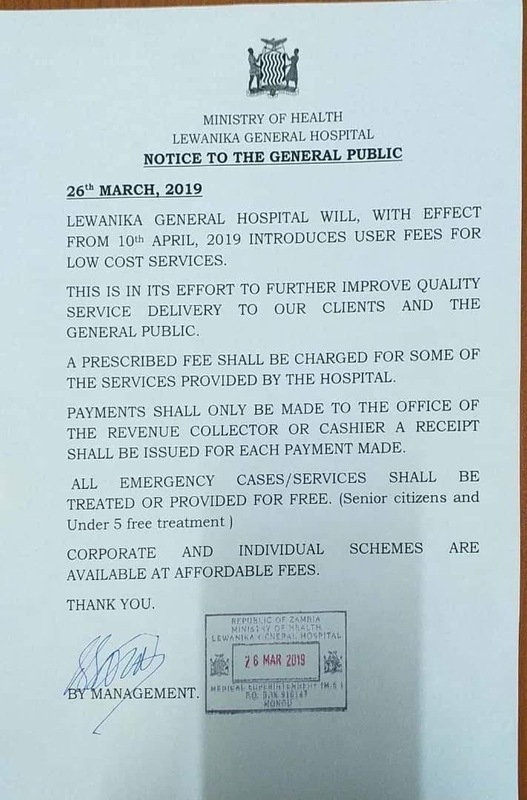 See below the notice put at Lewanika General Hospital in Mongu informing sick people and the general public that starting next month, the hospital will be charging for consultation and other services just like private hospital. Have a look at the public notice released at Lewanika General Hospital in Mongu. Talking of healthcare financing. Desperate times require desparate measures. The free health services in public health centres cannot not deliver quality healthcare in the absence of a sustainable healthcare financing model for the public sector. The hospitals have not received operational grants from September last year, how do you expect the health workers in government hospitals to take care of us? And you are busy building 20 mini-hospitals, and 10 fertility hospitals but failing to finance the basic health system. Mr. Ineptitude, doing what he knows best, making the system fail. I wonder why Lungu thinks Chitalu is doing a great job. Doesn’t Lungu have health advisors like he has economic advisors to guide him on health matters? We are killing the health system with this incompetent minister who can’t take advise from anyone. Can the government clearly state it’s policy of free healthcare without victimization of hospital managers and health workers.